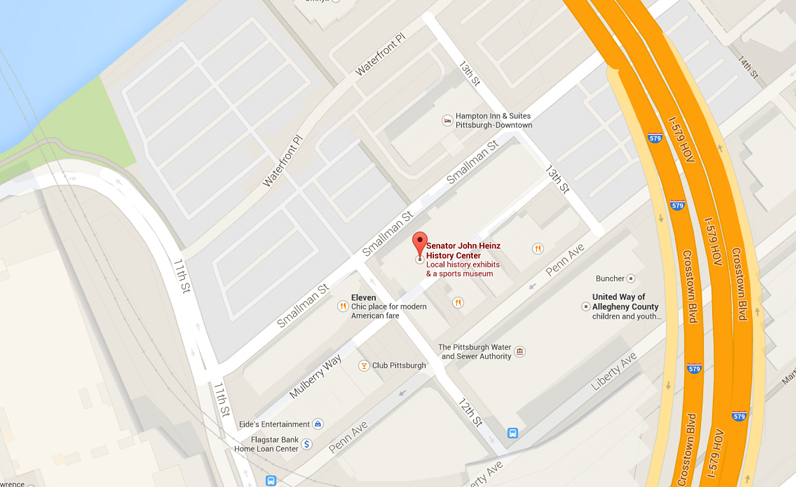 The History Center is conveniently located in Pittsburgh’s historic Strip District. 11th & Smallman Lot: Click here to view rates. History Center members receive a flat discounted $4 rate at the 11th & Smallman Street lot, subject to availability. Members are required to show their membership card to the lot attendant in order to receive the discount. 15th & Smallman Lot: Click here to view rates. 16th & Smallman Street Lot: $3 per day. Located behind the Produce Terminal. Convention Center Garage: Click here to view rates. Grant Street Transportation Center Garage: Click here to view rates. Located at the confluence of 11th Street, Liberty Avenue, Penn Avenue & 12th Street. Public Transportation: Port Authority offers bus service to the Strip District and nearby downtown. The History Center offers bike racks at the corner of 12th Street and Smallman Street. From Exit 28 (Cranberry, old Exit 3) on the Pennsylvania Turnpike, take Route 19 South to Interstate 79 South to Interstate 279 South,* to Interstate 579 (the Veterans Bridge). Drive across the bridge and follow signs for Seventh Avenue. Turn right onto Grant Street. Go one block, get in the left lane and turn left onto 11th Street. Go two blocks and turn right onto Smallman Street. *Alternatively, stay on I-279 S. Get in the left lane as you cross the bridge. Take the left-most exit, following overhead signs to the Convention Center and Strip District (via the 10th Street Bypass). At the first red light continue to go straight following the signs to the Strip District – You will travel under and around the Convention Center. At the first light after the Convention Center, make a left turn onto Smallman Street. Take Interstate 79 North to Interstate 279 North toward Pittsburgh. Go through the Fort Pitt Tunnel (if possible, get in the left-most lane through the tunnel). After exiting the tunnel, move to the far left lane of the Fort Bridge. Take the left-most exit, following overhead signs to the Convention Center and Strip District (via the 10th Street Bypass). At the first red light continue to go straight following the signs to the Strip District – You will travel under and around the Convention Center. At the first light after the Convention Center, make a left turn onto Smallman Street. Take Exit 57 (Pittsburgh, old Exit 6). Follow signs to Pittsburgh via Interstate 376 East. Take the Grant Street exit. This will have you curve to the right and put you directly on Grant Street. Stay on Grant Street, through downtown. As you approach Seventh Street, get into the left lane. Turn left onto 11th Street. Go two blocks and turn right onto Smallman Street. Port Authority Transit offers bus service to the Strip District and nearby downtown. Call (412) 442-2000 for bus schedule information.